I’m a little late with this post but I liked the idea! Alex Burrows began his NHL career playing his way up through the minors, undrafted before he solidified his spot on the top line with the Sedin twins. Bure known to many as the “Russian Rocket” for his knack for speed and to score many timely goals will have his jersey #10 retired this upcoming season. Chris Higgins after signing a 4-year extension will be looking to stay healthy through 82 games this season. Daniel Sedin matched his brother YET again when his scored his 756th career point also in his 905th career game. Edler will be forced to sit out the first two games of the 2014 Sochi Winter Games following his suspension from the 2013 World Cup before being eligible to play. Forever Canucks: Luc Bourdon, Pavol Demitra, and Rick Rypien left this world too soon but they will never be forgotten. Game 7 between the Canucks and the Chicago Blackhawks in 2011 was everything fans of the rivalry could hope for going all the way to OT ending only when BURROWS scored and the entire city cheered as the team finally eliminated the hawks. Harold Snepsts a heart and soul player, he and his moustache were quick to becoming fan favourites during his playing time with the Canucks. Ice will be taking over outdoors in the NHL this season as there will SIX outdoor [stadium] games kicking off with the Winter Classic in January. Juice [aka Kevin Bieksa!] scored one of the biggest goals in recent franchise history with his double OT goal May 24, 2011 that sent the team to the 2011 Stanley Cup Final. Kurtenbach served as the first official team captain when the Canucks joined the NHL in 1970 and was there in October 2010 to present Henrik Sedin as the current team captain. Linden though he may be retired was and still is an incredible mentor to past and current Canuck players. MacLean forever will be remembered by Canuck fans for making “the save” during the first overtime period of game 7 vs. Calgary in 1994. Naslund, Morrison, and Bertuzzi formed what fans called the “West Coast Express” scoring many very exciting goals as the team’s top offensive line. Olympic glory was more than just a possibility when Vancouver acted as host in 2010 with 7 Canucks participating and 3 returned from their quest with medals [Luongo -GOLD, Kesler-SILVER, and Salo-BRONZE]. President’s men in consecutive years [2011, 2012]. Quinn helped lead this team transitioning from former player to coach from 1991-1994 during which he earned a Jack Adams award  and coached the team on their 1994 run to game 7 of the Stanley Cup final. Ryan Kesler’s Selke play in 2011 reached a level dubbed as #beastmode and fans hope that he will find that level when the calendar flips to October 3rd. Sedin and Sedin have an insane amount of on ice chemistry constantly creating plays with the puck when it looks impossible and often more very difficult to stop when on their game. Torts having officially switched places with Vigneault will be looking to leave his mark on the team in a positive way that will hopefully lead to an extended playoff run. Utica has been named as the new home for the Vancouver Canucks AHL affiliate which will be named the Comets. Vintage will become more than the past when the Canucks host the Ottawa Senators in the 2014 Tim Horton’s Heritage Classic at BC Place Stadium March 2, 2014. Wilkins will forever be remembered by Canucks fans for scoring the FIRST goal in franchise history! X-factors throughout the line up are must for any team hoping for an extensive playoff run. You, fans in the stands will all be chanting #LUUUUUUUUUUU when #1 returns to the net this season! Zack Kassian will hopefully find his scoring groove in the upcoming 2013-2014 season. 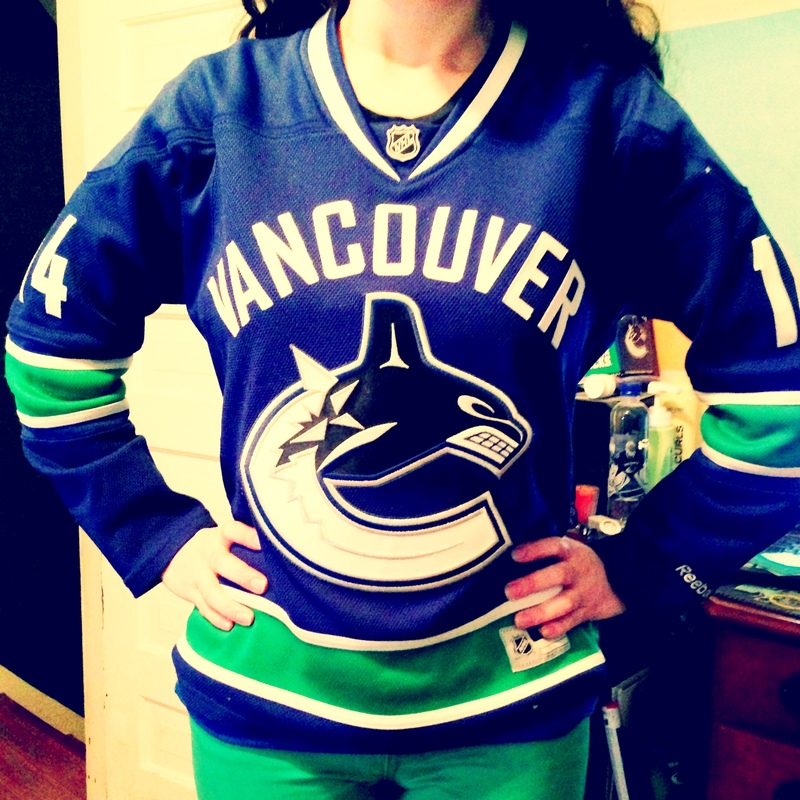 There you have it…it may not be epic or poetic BUT it is all Canucks A-Z! Enjoy! I’m a few days late in posting this BUT here goes! Hard to believe that ONE year has passed since I began this crazy blogging journey with you all! So how did this all come to be? Why start a blog? It all started because a friend suggested that it would be a good outlet for me to express and share my opinions regarding the team with others who enjoy the team and the sport. A blog allows me to say more than a Facebook status allows and to share my crazy hockey obsession with the world. To me, hockey is more than just a game. Hockey tells a story of more than just one player or team and can capture the hearts of cities and countries alike. Sometimes it can be predictable and other times a player or team will take everyone by surprise. Each season brings new excitement, new predictions, new surprises [good and bad! ], and the ever endless debates between fans and the media. Every season brings change and not one season is the same as the one that preceded it. I look forward to every October as my favourite sport returns from hiatus and once again my craziness begins. I am one of those fans who yells at the TV when the game is on….cheering when things go well and booing when the other team scores or the ref makes a bad call…if you want to watch the game in peace do not watch the game with me. It is impossible for me to watch the game without getting excited or expressing my distaste at something either said by the commentator or a bad play in the game. The way I see it…how can one really enjoy the game OR any sport[or show] without expressing themselves as it happens? Last season the league had a shortened season and THIS year the fans get not only a FULL season BUT 6 OUTDOOR games and the enjoyment of OLYMPIC hockey! People always ask me, don’t you ever get tired of watching hockey? Simply put, no. I get chills at the start of every new season as the calendar turns to October and this crazy season long journey begins! Can the 2013-2014 season begin already?! Hockey needs to come back soon! #70daysuntilhockey #OctoberFirst! Thank-you to all of those who have followed this blog from the beginning and thank-you to all those who have joined along the way! I love sharing my scatter-brained thoughts & interacting with all of you! Here’s to many more! One year later and I will continue to share my crazy hockey fan madness with all of you! Thanks again for joining me & my craziness! March 2, 2014 the Vancouver Canucks will host the Ottawa Senators in an “outdoor” game held at BC Place Stadium. Where will you be March 2, 2014 #CanuckNation? I know where I will be, watching our Vancouver Canucks take on the Ottawa Senators at B.C. Place Stadium!! Rumors became fact July 10th when it was OFFICIALLY announced that these two teams would be participating in the Stadium Series taking place throughout next season. The event will officially be titled “The 2014 Tim Horton’s Heritage Classic”. Interesting to think about heading into this game is the fact that while former Ottawa captain Daniel Alfredsson will not be participating in the Heritage Classic, as a current member of the Detroit Red Wings he will be participating in the WINTER CLASSIC vs. the Toronto Maple Leafs….oh the irony! This off-season has seen more than one surprising announcement from the Canucks trading Cory Schneider to Daniel Alfredsson leaving the Ottawa Senators. This week has seen the New Jersey Devils return to spotlight as forward Ilya Kovalchuk announced July 10th that he is retiring from the NHL after 11 seasons. This announcement comes just 3 years into his 15-year $100 million contract that he signed when he decided to remain with the Devils organization permanently. Over his 11-year career Kovalchuk amassed 816 points in 816 games [417 goals, 399 assists] scoring 30+ goals 9 times playing the Atlanta Thrashers[now Winnipeg Jets] and the New Jersey Devils. This announcement seems to have been a shock to the New Jersey franchise who probably expected him to play at least 5 or 6 more years given that he is only 30. He played a huge part in helping the Devils on their Stanley Cup playoff run in 2012 in which they finished as the runners up to LA…he came VERY close. It leaves many to question what could have been as his play on the ice could be polarizing. It has been speculated that while he has retired from the NHL, it is highly possible he could join the KHL. Is anyone else stumped how Boston & Pittsburgh keep signing multiple players to BIG money & LONG term contracts? The Bruins recently signed Rask to an 8-year contract [$56 million] after he more than earned his contract with the year he had. They also announced the extension of Patrice Bergeron to an 8-year extension [$6.5 million cap hit]. Add Iginla’s 1-year $6 million contract and that’s nearly $20 million just on THREE players. Look and Penguins who have many players on long-term deals that curiously seem to match their salary cap hit to their jersey numbers in many cases. How can they even have any cap space left?! Oh hey speaking of Boston…did you hear everyone’s favourite Tea Party member Tim Thomas has come out of hiding to announce that he wants to hear offers from teams in an attempt to comeback to the NHL next season. Any takers? Anyone? He’s known to be an incredible athlete when called upon, has won a few vezinas, a Conn Smythe, and a Stanley cup….BUT he has been known to also make controversial statements and decisions that cause social media to go crazy. Wherever Thomas ends up will be interesting mostly due to the fact that he spent last season suspended for not reporting to camp and opting to sit out the final year of his contract with Boston. While I have never been a fan of Thomas, I can appreciate that regardless of statements he has made…he has been known to be an incredible goal-tender and is capable to help any team win. This off-season has been more than interesting to say the least and more surprises and expected announcements are sure to be coming. Some days it feels like the off-season will last forever and others it feels like October is right around the corner.Soon there will be official pre-season and regular season schedule released, so here’s to the summer that will end before we know it! P.S. It looks like @strombone1 has returned to his humorous ways with twitter[if you don’t follow him yet, you should as he’s one of the best to follow! ]…welcome back LOU!! Everyone’s favourite or least favourite day of the NHL off-season has arrived ladies and gentlemen: Free Agent Frenzy! If you are like me than you also have a love/hate relationship with the crazy part of the off-season when your favourite team/players makes moves that anger or excite you. Some teams made bigger moves while others went for the smaller moves. In one of the most surprising moves of the day, Daniel Alfredsson chose to not re-sign with the Ottawa Senators but has indeed signed a 1-year contract [$5.5 million] with the Detroit Red Wings. Don’t forget with the re-alignment official at the start of next season, Detroit and Ottawa are now division rivals both on the Eastern side of the equation. The Detroit Red Wings have also signed free agent Stephen Weiss to a 5-year contract [$24.5 million]. Former Detroit Red Wing, Valteri Filppula has agreed to a 5-year contract [$25 million] with Tampa Bay. Following the loss of their longtime captain to Detroit, the Ottawa Senators acquired forward Bobby Ryan from the Anaheim Ducks in exchange for forwards Jakob Silfverberg, Stefan Noesen and a 2014 first round draft pick. Yesterday the Boston Bruins grabbed headlines with the trade of Tyler Seguin and Rich Peverley to the Dallas Stars. Today a few more fan favourite Bruins signed elsewhere when Nathan Horton agreed to a 7-year contract with the Columbus Blue Jackets and Andrew Ference agreed to a 4-year contract with the Edmonton Oilers. Speaking of the Bruins grabbing headlines remember how it was initially reported that he chose Boston prior to the trade deadline? Well, this time he its true he has agreed to a 1-year contract with the Boston Bruins [$6 million]. It is safe to say I can longer root for you Iggy now that you have crossed over to the dark side! Jason Labarbera signed a 1-year contract [$1 million] with the Edmonton Oilers. Last year it was the Wild that made the biggest splash in the free agency pool with spending $198 million on 2 players. This year has been a much quieter start to the free agency bonanza for Minnesota. The Minnesota Wild traded forward Devin Setoguchi to the Winnipeg Jets for a 2014 2nd round draft pick. Everyone’s favourite pest, Matt Cooke has come to terms with the Minnesota Wild on a 3-year contract [$7.5 million]. Rob Scuderi has come to terms with the Pittsburgh Penguins on a 4-year contract [$13.5 million]. Scuderi won the Stanley Cup with the Penguins in 2009 and with the LA Kings in 2012. The Dallas Stars have signed back-up goalie Dan Ellis to a 2-year contract [$1.8 million]. Stanley Cup champion goalie Ray Emery has signed a 1-year contract with the Philadelphia Flyers. Goalie Nikolai Khabibulin is once again a Chicago Blackhawk after agreeing to a 1-year contract. Former Philadelphia Flyer, Danny Briere agreed to a 2-year contract [$8 million] with the Montreal Canadiens. Claude Giroux agreed to an 8-year contract extension with the Philadelphia Flyers. Toronto made some bold moves following the buyout of Mikhael Gabrovski yesterday. The re-signed Bozak to a 5-year deal [$21 million] and signed a free agent David Clarkson to a 7-year deal [$36.75 million] that includes a limited to trade clause + a no move clause. The Nashville Predators made a few splashes in the free agency pool to help fill some of the gaps that haunted them last year. Stanley Cup champion, Viktor Stalberg agreed to a 4-year contract [$12 million]. Former Minnesota Wild forward Matt Cullen and Nashville agreed to terms on a 2-year contract [$7 million]. The Predators also signed forward Matt Hendricks to a 4-year contract [$7.4 million] and forward Eric Nystrom to a 4-year contract [$10 million]. The New York Islanders re-signed Travis Harmonic to a 7-year contract [$27 million]. The Isles also re-signed Evgeni Nabokov to a 1-year contract [$3.25 million] following a solid year by the veteran goal-tender who helped New York get back into the playoffs for the first time in 7 years. The Canucks began their free agency course earlier this week when they bought out the remainder of Keith Ballard’s contract to free up cap space and allow him to become a free agent. As you know he was not unemployed for long as he was snapped up by the Minnesota Wild for a 2-year deal worth [$3 million]. Best of luck Ballard near your home town, you deserve a fresh start! [***has yet to be officially announced]. Rumor has it that free agency has claimed Mason Raymond who reportedly was signed by the Calgary Flames to a 2-year deal. It would exciting for him to play in his home province in front of friends and family. I will miss saying things like #EVERYBODYLOVESRAYMOND every time he scores. I will not root for the Flames ever if this rumor comes to pass, but I do wish Mason the best of luck wherever he ends up. Forward Maxim Lapierre has signed a 2-year contract[$2.2 million] with the St.Louis Blues. You will be missed by the fans! Best of luck in St.Louis Max! Short-term Canuck Derek Roy has signed a 1-year contract[$4 million] also with the St.Louis Blues. Vancouver signed defenceman Yannick Weber to a 1-year contract [$650K] along with forward Brad Richardson to a 2-year contract. Welcome to Canuck Nation, Weber & Richardson! Remember going into free agency the Canucks did not[& do not] have a lot of cap space to make a big splash. Canuck nation is also waiting to hear confirmation of defenceman Chris Tanev being re-signed. Fingers crossed it is announced sooner rather than later and that the team is not forced to match some ridiculous offer sheet [mind you that is a real possibility!]. Day one of free agency has come and gone with its mark left on many teams. It is hardly the end of the free agency saga that will continue over the next few weeks. Along with more signings to come there will also inevitably be more trades announced. Prepare yourselves hockey fans, this is only the beginning!